My definition of cracker is – baked chips! They’re yummy, they make the perfect snack and they’re healthier than chips since they’re baked not fried. And while we’re talking about healthy, who can deny the benefits of spinach! Bet you haven’t tried cheese with spinach. 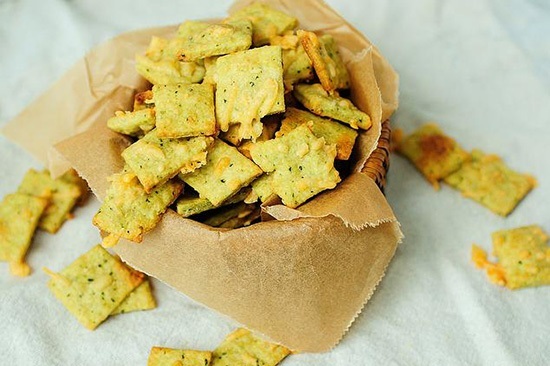 If you have you know how delicious it is, and if you haven’t, well here’s an amazingly simple recipe to make awesome Cheesy Spinach Crackers at home. They’re light and delicious – the perfect evening snack. Set the oven to preheat to 400 degrees F.
Clean the spinach thoroughly and then remove the large, tough stems. Roughly tear the spinach leaves and then put them with the water and cheese in a food processor or blender. Blend until smooth. In a large mixing bowl sift the flour and baking powder together. Add the melted butter, salt and olive oil to the mixture. Slowly incorporate the spinach-cheese-water mixture into the flour while kneading all the while using clean hands. Keep going till all the spinach mixture is used and a smooth dough is formed. If the dough is too sticky, add more flour. Dust a rolling board with flour and roll out the dough until thin and even. Cut it into bite-sized pieces using a pizza cutter. Gently spray cooking spray on a baking sheet and arrange the crackers on it. Place in the preheated oven and bake for 20 – 25 minutes or until crispy. Remove from the oven when done and allow to cool completely. Store in an air-tight container for up to 3 days.